I had a great time visiting with Dr. Chris Kirk yesterday for a series of pre-talk interviews for his upcoming Hot Science – Cool Talks presentation, Your Eye, My Eye, and the Eye of the Aye-Aye, part of the awesome Hot Science – Cool Talks series, presented by the Environmental Science Institute. Dr. Kirk is an amazing physical anthropologist and an Associate Professor with the Department of Anthropology at the University of Texas at Austin. As you’ll see in my video interviews with him, he has incredible energy and knowledge about primate evolution and the evolution of senses. Don’t miss his Hot Science – Cool Talks presentation on Friday, December 2, 7pm at Welch Hall, Room 2.224. And if you can come early, there be lots of fun pre-lecture activities beginning at 5:30. Thanks, Dr. Kirk, for the wonderful interview videos! I know everyone will enjoy learning more about primate evolution. Find out why depth perception and detailed vision give humans the best eyesight out of any living mammal. (But what about extinct mammals and other living vertebrates? You’ll find out!) Learn more about Dr. Chris Kirk’s specialty in primate evolution and the evolution of senses. Find out the interesting and unusual feature that human eyes have and that anthropoids do not. Oh, and also learn what NOT to do when you visit monkeys at the zoo! Find out what mammal has the best combination of sensory adaptation and learn about the problem with compound eyes. Then discover how what you inherit from your ancestors has a profound affect on what your anatomy can do. Dr. Chris Kirk also describes how his love of anthropology growing up helped him find his niche as a physical anthropologist. Commander Ben holds a 44 million year old invasive species fossil in his hand. Learn more about the new species of primate, Mescalerolemur horneri, that Dr. Chris Kirk helped discover in West Texas. Dr. Kirk is an Associate Professor with the Department of Anthropology at the University of Texas – Austin. His talk, Your Eye, My Eye, and the Eye of the Aye-Aye, is part of the awesome Hot Science – Cool Talks series, presented by the Environmental Science Institute. Don’t miss his Hot Science – Cool Talks presentation on Friday, December 2, 7pm at Welch Hall, Room 2.224. And if you can come early, there be lots of fun pre-lecture activities beginning at 5:30. This is part four of Commander Ben’s interview with Dr. Kirk. Find out which mammal has the best combination of sensory adaptation and learn about the problem with compound eyes. Then discover how what you inherit from your ancestors has a profound affect on what your anatomy can do. Dr. Chris Kirk also describes how his love of anthropology growing up helped him find his niche as a physical anthropologist. This is part three of my interview with Dr. Kirk. Visiting Zoo Monkeys: What NOT to Do! Find out the interesting and unusual feature that human eyes have and that anthropoids do not. Oh, and also learn what NOT to do when you visit monkeys at the zoo. This is part two of my interview with Dr. Kirk. Find out why depth perception and detailed vision give humans the best eyesight out of any living mammal. (But what about extinct mammals and other living vertebrates? You”ll find out!) 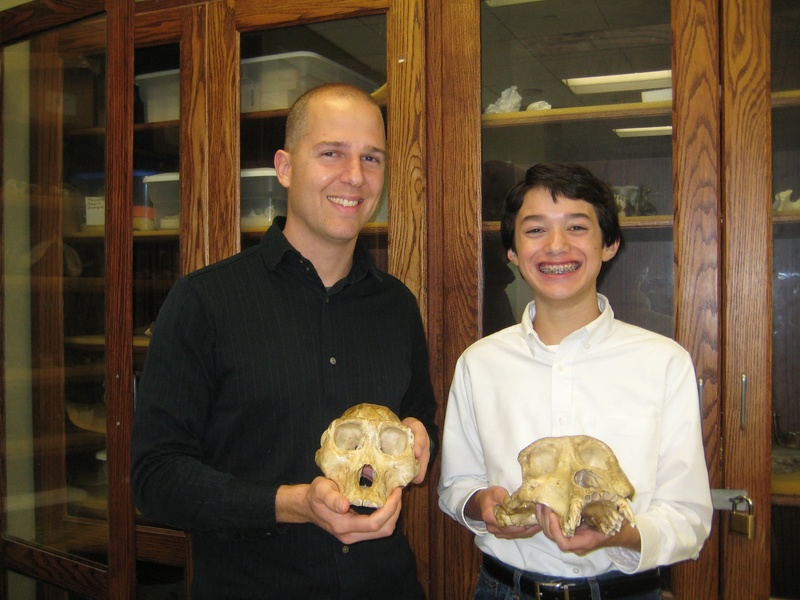 Learn more about Dr. Chris Kirk’s specialty in primate evolution and the evolution of senses. This is part one of my interview with Dr. Kirk.